Window treatment products have come along way since ‘Venetian Blinds’ were one of the few choices available. Click on the tabs below to see some of the many exciting options available for your particular requirements. As always, feel free to call with any questions you may have when selecting window treatments for your home or business. Combi Shades offer the soft look of a sheer, the privacy of a shade and privacy control at every level. 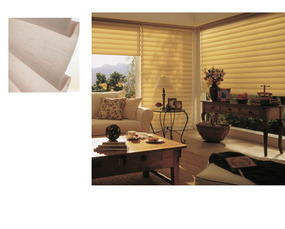 Horizontal Blinds are available in a variety of materials including wood, faux wood, metal and fabric. 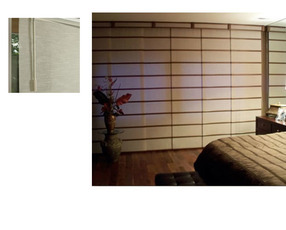 Vertical Blinds are available in a variety of materials including PVC and fabric, Elliptical and sheer. Roller Shades offer a wide choice of high quality fabrics in both solids and textures with opacities ranging from transparent to room darkening. Roman Shades combine the charm and elegance of soft drapery fabric and provide a clean, uncluttered appearance while maintaining privacy and light control. Woven Wood Shades are becoming the ‘Green’ choice for many, our woven wood shades feature a casually elegant collection of carefully selected bamboos, rattan, reeds, jutes, and woods. Pleated Shades offer a wide choice of high quality fabrics in both solids and textures with opacities ranging from transparent to room darkening. 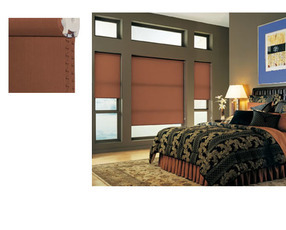 Cellular Shades are available in single, double and triple cell construction. Available in hundreds of combinations featuring smooth and textured fabrics from sheer to opaque and endless color choices to suit both residential and commercial applications. Skylight Shades are available in Pleated shade fabrics, Cellular shade fabrics and Roller shade fabrics. Utilizing tracks on either side of the opening, systems can be either motorized or manually operated. Shutters have always been the choice of the discerning homeowner. Shutter design and construction has come a long way and we feature choices to suit all applications and budgets.